Most of the furniture of home is used in living room as it is most special room where you see a rush every time. Office fellows, family friends, neighbors or even the guest are mostly entertained in living room. So we should always look for some more serviceable furniture objects that can make your living room perform much better. Now a days pallets have been used to gain the domestic furniture and it really goes cheaper than to buy the industrial pieces of furniture. Here we are going to share a nice DIY pallet end table plan with you which also play a vital role in living room. It is mostly placed in sides of couch or sofa carrying a flower pot or a light lamp piece. You may also put your coffee or beverage mug on it to release your hands for some time. 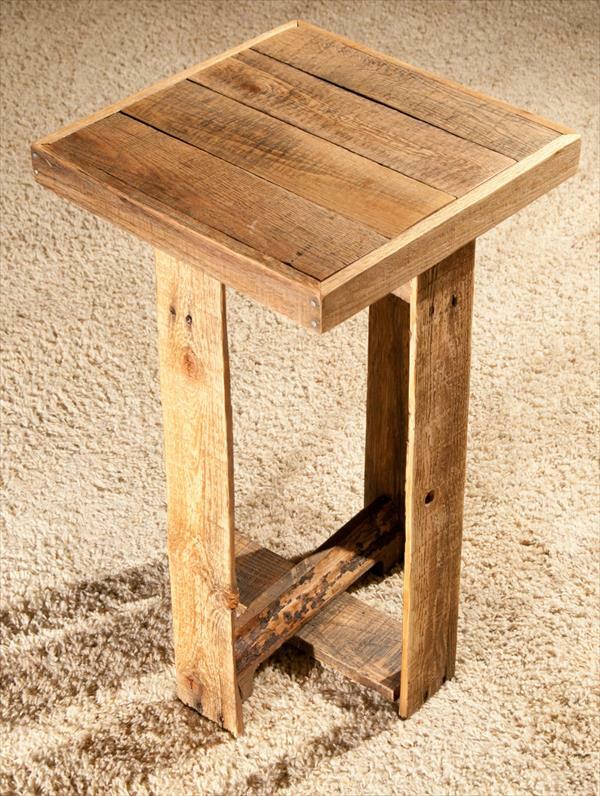 This DIY pallet side table has been shaped up out of some rustic pallet skids found on the ash heap.